So...exactly what is kefir? I have to admit, if anyone had asked me that a short while back, I would have thrown up my hands and shaken my head in puzzlement. Throughout my years of experimenting with goat milk, I had never heard of this strange-sounding product until recently. Kefir is a cultured milk product, along the lines of buttermilk and yogurt. What sets kefir apart from these other products, however, is the culturing agent. Kefir is made from kefir grains, which are unusual, cauliflower-looking structures that contain a multitude of micro-organisms, including both bacteria and yeast. These organisms work together to ferment the milk. The resulting product is a silky smooth drink that is slightly thicker than milk, and thinner than yogurt. Depending on the fermenting time and method, it has either a slightly tangy taste, like yogurt, or a more sour taste. The activity of the yeast actually results in a slightly alcoholic content, from about .5% up to 2%. My first goat milk kefir! Kefir is used in much the same way as regular milk — drink it plain, pour it on cereal, or use it to make fruit drinks and smoothies — even ice cream! Kefir can also be used to make kefir cheese that's very similar to quark or labneh yogurt cheese. The health benefits of kefir are mind-boggling. In fact, by comparison, kefir makes plain milk sound like junk food! The name itself, of Turkish origin, means "good feeling," an indication of the overall healthy state that the drink imparts to regular users. Medical studies with positive results using kefir have been conducted for conditions that include diabetes, high cholesterol levels, high blood pressure, cancer and many more. As a probiotic, kefir is the only food that provides the extensive variety of beneficial organisms, and, particularly beneficial yeast, that can actually re-colonize the microflora of the intestinal tract. Anecdotal evidence of kefir's positive health effects is nearly as old as the first grains of kefir themselves, dating back thousands of years to its origins in the mountainous Caucasus region. There, kefir was traditionally made in animal skin bags, which would be hung on the door to encourage jostling to keep the kefir mixed. 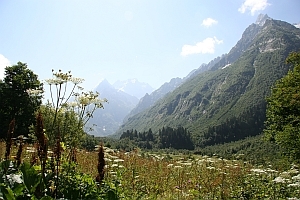 Birthplace of kefir — the beautiful Caucasus mountains. Kefir grains were highly valued in the ancient tribal culture, and served as a symbol of wealth. However, modern studies have shown that the grains are more correctly a symbol of health, as the Caucasus region is widely haled for the longevity of its people — centenarians are common for the area — and illness and disease have never been a widespread problem. The daily consumption of kefir and other cultured milk products is credited significantly for the culture's health and long life span. Although kefir is traditionally made with goat, cow's or sheep's milk, it is by no means limited to these dairy products. Kefir can be made in any liquid which contains sugar upon which the kefir organisms can feed. Common varieties include sugar water kefir, along with coconut, soy and nut milk kefir. Dried fruits, herbs or fruit juices are sometimes added to the brew to increase flavor and nutritional properties. I personally see kefir poised to be the "new" yogurt. When I was a child, yogurt was a little-known fringe food used almost exclusively by health fanatics and counter-culture activists. Now, however, yogurt is as mainstream culture as it gets (notice that little pun — "culture"...?). Containers are packed in kids' lunchboxes daily, television commercials tout yogurt's health benefits, and snacks like frozen yogurt and yogurt-covered raisins are widely enjoyed. Although commercial varieties of kefir are available in containers at health food/whole food stores, and some groceries, kefir is still something of a well-kept secret. Kefir's health benefits make those of yogurt pale by comparison, and I'm sure it's only a matter of time before an ever-increasing health-conscious society embraces kefir with a passion. I haven't yet checked into whether the commercial preparations have all the healthy properties of traditionally prepared kefir, but it's easy enough to make kefir yourself at home. What Is Kefir: How Can I Try It? Ready-to-drink kefir is widely available in groceries in the dairy case. Selection may be limited in some, while others carry several types of milk and non-milk kefir in various flavors. I bought this Redwood Hill Farm Blueberry Pomegranate goat milk kefir at a Whole Foods Store, and it was incredible. You know something is good when you have to fight the kids for it! Milk kefir grains, like those sold by our affiliate, Cultures for Health in the image to the right, are an easy and inexpensive way to have a continuous supply of kefir for yourself. The grains can be used with goat milk, cow milk or coconut milk, and can be recultured. Kefir grains are easy to culture, and you can use them over and over. The grains multiply rapidly, and supposedly last for generations when properly cared for! They are also very inexpensive (under 20 USD), and you can have kefir for the rest of your life with a single investment. I don't think there's anything better you could do for your health for that small amount of money! If you live in a place that has only ultra heat treated (UHT) goat milk available, making kefir with it can be a way to re-gain some nutritional value from it. The high heat used during this pasteurization process destroys many of the nutrients, and renders the proteins unfit for making cheese. However, you can still culture kefir with it, and reap the benefits of the probiotics and nutrients that kefir provides. In my opinion, this is probably the best way to use UHT milk, as it has minimal nutritional value, otherwise. The article, How to Make Kefir, explains kefir making using commercial starter cultures, freeze-dried grains and live kefir grains--as well as instructions for making kefir cheese. The evidence for kefir has convinced me that this is one food that's worth adding to our daily diets. At first, I was hesitant of how it might taste, but the kefir that I've cultured for 24 hours tastes very much like yogurt, only as a liquid, rather than with a pudding consistency. I've made several batches of goat milk kefir so far, and we really enjoy it mixed with orange or lemon juice and a little sweetener as a breakfast drink. My kefir grains are continuing to grow nicely, and we all look forward to our "kefir milkshake" every day. I can now culture about 3 quarts of milk a day, which is probably about as much as we will need. This amount of kefir makes a very nice bowl of kefir cheese, which I'm currently testing for various uses. Continued research into the health benefits of kefir has revealed alleged anti-inflammatory properties, which I plan to explore further through personal experimentation (as I collect enough kefir grains to use). You haven't heard the last on kefir--there will be more kefir articles very soon, so check this page again, or sign up for the blog or newsletter to catch the latest! Want more articles on this topic? Tell us by taking our quick preference survey! Articles are updated frequently, so check back here for any new information related to What Is Kefir!